The ultimate media platform to promote all products, services and events in the strings market worldwide. The Strad is regarded as the bible of the stringed instrument market worldwide, and rightly so. We have been covering string issues since 1890 and have developed an in-depth knowledge of all sectors and the requirements of companies and individuals who advertise in it. 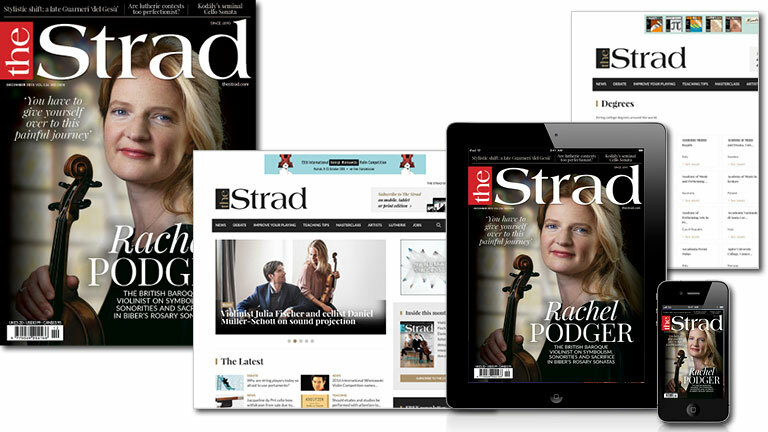 Within the past twelve months, The Strad has had a major expansion within the digital platforms including the launch of a mobile site leading the way for the classical music industry. The advertisements in print are now carried on the digital edition, which gives the advertisers additional exposure at no extra charge. In order to cover the strings market fully, do check all of The Strad's media platforms. Check The Strad Forward Schedule 2019 to find out details of copy deadlines, special issues and supplements for this year. Checking the schedule may help ensure that your promotion coincides with some of the world's major strings events and trade shows. Just scroll down to the 'Print Opportunities' section and click on 'The Strad Schedule'. For any further details, contact The Strad sales team now. The Strad Degrees Online Hub is The Strad's first-ever mini-site. Launched last year, it contains essential information on string courses worldwide, and includes invaluable editorial content for both students and teachers. This is a great opportunity for advertisers to promote their products and services in this special education section of our website. Some education establishments have already started promoting their schools and courses further, by taking out 'Premium Listings'. For more information on available placements and other opportunities, please contact The Strad sales team!